Funny tin "What's Wrong with Being Born in a Barn?" sign illustrates a nonchalant attitude about clutter. 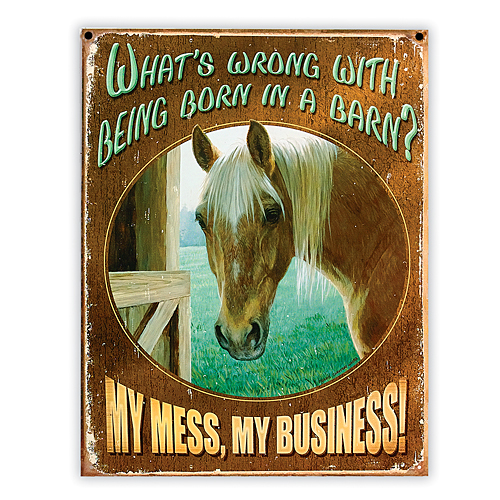 The beautiful, decorative sign is the ideal gift for friends who have a sense of humor. Use indoors or outdoors. Features artwork from Persis Clayton Weirs. Lightweight, sturdy and easy to hang. Tin, 12 1/2 x 1/4 x 16". I'm waiting for some indignant slob on Hoarders to hang this in their living room and point to it when the professional organizer/psychotherapist shows up. Is It Strong Enough for Me to Hang Myself?